Set to the powerful music of the legendary American jazz saxophonist and composer John Coltrane, the work uses the dancing body to inspire the audience, allowing them to transcend their own personal blues momentarily. "In this piece, given its Washington, D.C., premiere last February, Ailey dancer turned choreographer Jamar Roberts took on the current unsettled social climate. For help, he turned—as one does—to John Coltrane. The peerless jazz saxophonist and composer is often my own go-to in disorganized moments; he can lead you into the depths unease, then slip past it toward a distant, beckoning peace. Roberts and his dancers captured the ineffable questioning in Coltrane’s music, following its winding paths and its sense of spiritual freedom. The excellent Ailey dancers made palpable an atmosphere of frustration, but they also delivered release." "As emotional as it was virtuosic. A veteran of the Ailey company, Mr. Roberts may be known for his strength and commanding presence as a dancer, but he has a softer side too, and both came through in Members, set to two recordings by John Coltrane, Dear Lord and Olé. The program included a Ralph Ellison quote about the blues being 'an impulse to keep the painful details and episodes of a brutal experience alive in one’s aching consciousness, to finger its jagged grain, and to transcend it.' Those words reverberate throughout Members." "Subtle and wise. Members Don’t Get Weary counts the ways 'the current social landscape in America', as Roberts describes it, might make a person weary. Yet, like the blues that inspired it, his choreographic debut for Ailey does not exacerbate our pain so much as assuage it by digging in. The piece moves through the frozen surface of despair to its soft tissue. The swing, soar and roil of the two tracks from Coltrane’s Olé that Roberts uses serve as a counter to the dancing’s darker mood." "Members Don’t Get Weary is a strong, stereoscopic look at life in a black community. Roberts also designed the costumes for this piece, mostly blue outfits that allude to uniforms: jumpsuits, prison garb, hospital scrubs. At the start, ten barefoot dancers wear huge straw hats, implying that they’re field hands under a hot sun; the movement mingles gestures of work with gestures of worship. Sometimes it evolves toward the total physical surrender of religious possession. Brandon Sterling Baker designs diagonal shafts of light that permit artists to appear and disappear from the back of the stage, occasionally punctuated by a bright spot; is that a sheriff’s searchlight or the eye of God? Toward the end, a woman peels the shirt off a man, a moment of liberation powerful and delicate at once. The dark drop that limits the space above the dancers’ heads lifts, allowing them to bathe in the music and the light. 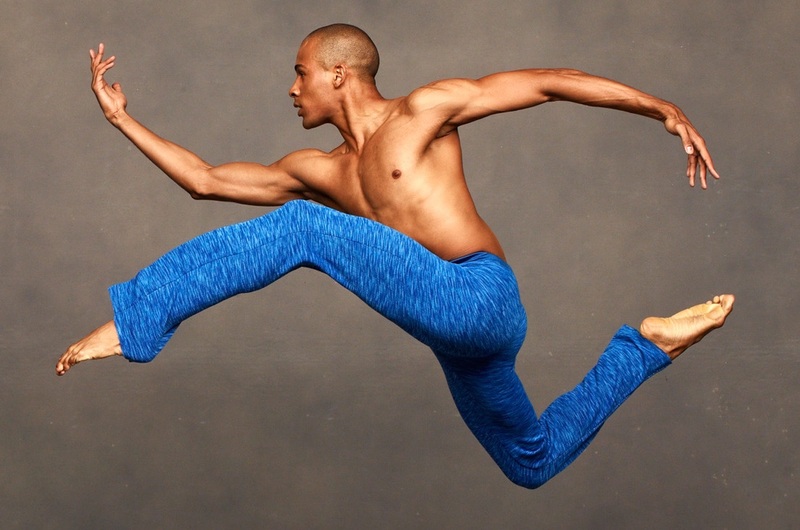 Roberts has made a serious contribution to the Ailey rep, one that should endure." The creation of Members Don’t Get Weary is supported by commissioning funds from New York City Center. Major support for the creation of Members Don’t Get Weary is provided by Denise Littlefield Sobel and Michele & Timothy Barakett. Additional support for the creation of Members Don't Get Weary is provided by Simin N. Allison, Patricia S. Brim, Addie & Tom Jones, Judith McDonough Kaminski & Joseph Kaminski, Daria L. & Eric J. Wallach, Vera F. Wells, The Ellen Jewett & Richard L. Kauffman New Works Endowment Fund, Kansas City Friends of Alvin Ailey - Sara & Bill Morgan New Works Endowment Fund and The Jeanne Greenberg Rohatyn & Nicolas Rohatyn New Works Endowment Fund. “Dear Lord” and “Olé” written by John Coltrane. Published by Jowcol Music. Used with permission.